"It is disease that makes health pleasant, hunger that makes fullness good, and weariness that makes rest sweet." 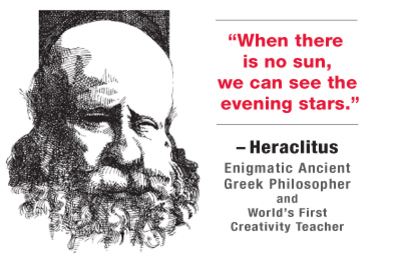 Heraclitus is saying that we don't fully appreciate something until we have thought about or experienced its opposite. For example, success is more rewarding if we've tasted defeat, life more precious if we've been close to death, and love dearer if lost and regained. As the German novelist Hermann Hesse put it, "Any life expands and flowers only through division and contradiction. What are reason and sobriety without the knowledge of intoxication? What is sensuality without death standing behind it? What is love without the eternal enmity of the sexes?" Expressed another way, piano virtuoso Artur Schnabel once explained the secret of his artistry by saying, "The notes I handle no better than many pianists. But the pauses between the notes — ah, that is where the art resides!" The 13th-century Sufi poet Rumi had a similar insight, "Every craftsman searches for what's not there to practice his craft." So, the questions this insight suggests are: What's “dark” or missing in your current situation? How does it shed light on what is there? For me personally, the short days shed light on the many good things that have happened to me this year. This includes the health and well-being of my family and the people close to me. I'm also quite grateful for the many opportunities I've had this year including travel to Japan, China, Vietnam, and Morocco; getting the Ball of Whacks to market; participating in the FINA World Masters Swimming Championships; and diving into the blogosphere (finally) and meeting some very interesting people from all over the world. To all who read this: may the light shine on you! Pretty enigmatic. 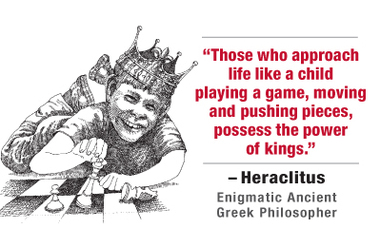 But I think there's a creative strategy implicit in this insight, and I interpret it to be: "Watch out for Moreness." When things are made larger, they take on a complex, new life of their own, and unexpected -- even undesirable -- things can happen. Here's an example. Let's say that you have a recipe for strawberry shortcake that serves four people. Now, let's suppose that you invite 50,000 people over for strawberry shortcake. At this point, the biggest challenges confronting you have nothing to do with the recipe. These include buying strawberries on the commodities market, making deals with the teamsters to deliver enough cream, traffic-flow coordination, and large-scale renting of tables, chairs, bowls, and spoons. The same things can happen when situations become larger: issues come up that weren't even thought about in the original plans. Two questions to ask yourself as you contemplate a current problem or issue: Where would you be better served with "less" rather than more? What problems might having "more" create for you? 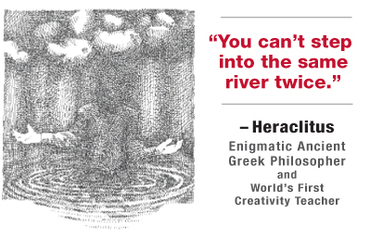 The following quote is from the ancient Greek philosopher Heraclitus (flourished 500 BC), and at the right an interpretation (by me) of this insight. 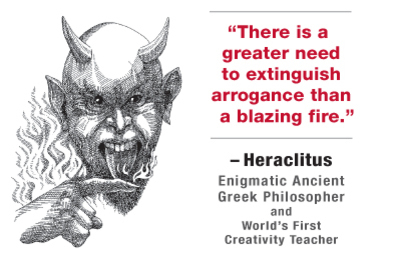 I think what Heraclitus means is that making new connections lies at the heart of the creative process. • Inventors combine components to create new products (Gutenberg joined together the wine press and the coin punch to create moveable type and the printing press). • Entrepreneurs brings together resources from different arenas to build new businesses (Joseph Pulitzer added large-scale advertising to high speed printing to create the mass circulation newspaper). • Engineers mix different materials to create new ones (ancient Greek metallurgists alloyed soft copper with even softer tin to produce hard bronze). • Poets mix unusual images to create provocative metaphors (Luciano de Crescenzo, "We are all angels with just one wing -- we can only fly while embracing one another"). • And, humorists juxtapose unrelated situations for comic effect ("What do you call a clairvoyant midget who just broke out of jail? A small medium at large!"). Today, I'm going to try to connect some previously unconnected ideas! How about you?